During production of the January 1986 issue John Byrne offered his resignation to Marvel, after which time he would go on to a very well received reinvention of Superman for DC comics. Recent years have seen John’s critical and commercial clout fall from this mid-80s peak, and the older John Byrne can come over as curt and abrasive, with some opinions expressed on his own website that are often unkind, even cruel. Yet for the time he was behind the Fantastic Four he regularly produced a book that, while sometimes cloying, sometimes too immersed in the past, was almost always entertaining, and almost always an essential read. With all this said, Byrne leaves the book with more of a whimper than a bang, all his ambition on the book apparently spent. Outside control looms large, though I’ve always had a soft spot for John’s Beyonder/Doom story. Faring less well is #286, what has to be the worst idea for a Fantastic Four story ever: the resurrection of one of the original X-Men (Jean Grey) from events that transpired in the X-book, as a lead-in to a brand new X-book. (X-Factor). It’s a truly dreadful, shameless sales ploy, of which John can’t be blamed as it was beyond his decision to do it. It was subsequently rewritten at the behest of Jim Shooter, with “a good third” (John’s words, from his own website) redrawn by Jackson Guice and rewritten by Chris Claremont. Speaking of John’s own words, then while the same issue has a “special thanks” credit to comic writer Kurt Busiek, John’s site has him as “an annoying little eager-beaver fanboy”. Ouch! Yes, it’s sad to report that John’s last few issues of the comic are absolutely dreadful, his worst work on the series by some margin. Look out for the tale of “Licorice” Calhoun, the biggest black stereotype in comics – yes suh! – who takes the title back to its ’74 slump by demonstrating a mutant power to change the timeline of the entire world. His dream power whilst stirring from a coma causes it to become 1936 again, a situation of which Nick Fury tries to take advantage by killing Hitler. I’ve tried to think of a more sophisticated description of that plot other than using the word “garbage”, but I’m afraid I couldn’t think of anything more appropriate, while having six of his last eight issues open with a quotation from 18th - 20th century writers (and even a couple from B.C.!) is pretension bordering on ludicrousness. Characters once more talk in great chunks of exposition, with #289’s Basilisk practically reciting to himself how he puts one foot in front of the other to walk. And while the writing is beginning to crumble under itself, so too the artwork (fun and chunky though the ’86 Byrne is) degenerates into larger, page-killing panels and splashes, along with multiple head shots. Most distressing of all is the characterisation, characterisation that had been going awry for some time. John’s “absent minded lovable professor” take on Reed Richards is fine, but lest we forget Stan had him drawn as a pipe-smoking, no-nonsense semi-alpha male only too eager to slap Johnny into line. Compare Reed 1971 style with this upgrade and it’s hardly the same character, the same with Sue’s borderline psychotic Invisible Woman which passes as “empowered”. Then there’s the return of Wyatt Wingfoot, rather pointless since he’s unrecognisable from the character he used to be all those years ago, and Tigra, who gets a cameo in #293 but no real affinity with a team that she was practically a member of for a brief time back in the ‘70s. 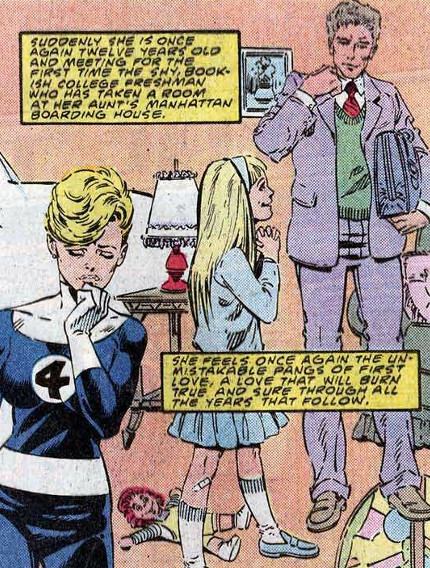 The most controversial element of the run is Sue remembering how she first met Reed and they had an attraction when he was attending college and she was just 12 years old. An awkward bit of retrofitted continuity (Stan Lee made it clear that there was a sizeable age gap, but suggested that they met when they were both kids) that has since also been rewritten. While a revised "first meeting" was presented in 2013's Volume 4, Issue #4, an explanation for the revisal was given in the letters pages of that year's sister title, FF #9. Editor Tom Breevort, explaining the reasoning of himself and writer Matt Fraction, stated that "While it’s always our intention to respect the continuity and the past, especially with so many stories told over such a long period of time, there are going to be instances where what worked in 1985, or 1975, or 1965, doesn’t work as well in 2013. Looking back on that story […] that sequence struck both of us, in 21st century terms, as being more than a little bit creepy. So we made a conscious decision to modify and update it somewhat, keeping the essence of the situation the same […] but discarding the inappropriateness of a college-aged man eyeing a twelve-year-old girl. (It’s not the first time that this has happened in Marvel history – Byrne’s scene overwrites earlier mentions in the Stan and Jack era that Sue was the girl-next-door that Reed left behind when he went away to serve with the O.S.S. in WWII, which can longer be true in either 1985 or 2013.)" It could, of course, be argued that Breevort and Fraction were reading too much into the story, which, as illustrated, arguably shows Reed embarrassed and uncomfortable, rather than "eyeing" the 12-year-old Sue Storm. 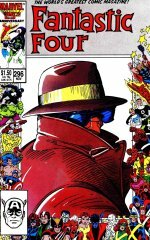 John’s final issue was a pulp story that saw the original FF worshipped as Gods and a society built up around them… a tired and uninspired set-up that was plotted for Roger Stern to complete. It wasn’t, strictly speaking, the first time Stern had worked on the title – he’d ghost scripted some Avengers dialogue to make it sound authentic when John was writing the book, and he does at least inherent a nice dynamic with the embittered Thing. Art-wise, there’s many different names in the mix, including John’s final pencils, Al Gorgon, Joe Sinnott, both Buscemas and Jerry Ordway. Covers are a mixed bunch, with the cover to the December issue arguably the most nondescript ever. All of this would perhaps be a washout were it not for #296, the 25th anniversary issue of the FF. Put together by a combination of fourteen artists on pencils and inks (including Sinnott, Ordway, John Buscema and the talented Barry Windsor-Smith) it’s plotted by Jim Shooter and written by Stan Lee himself. Counting aside his 14-page cartoon adaptation for #236, this was Stan’s first Fantastic Four story for fourteen years, and more copy had passed – 170 issues – than he’d written in total. A gargantuan 64-pager, it puts Ben through even more emotional hoops than he’d previously been through, as with Johnny dating Alicia, not only does it validate Alicia as a character but it also gives Ben reason for some new remorse. Being hung up over events from 1961 was one thing (no pun intended), but here Ben has some fresh angst, coupled with his feelings of rejection now the She-Hulk has successfully taken his place. (In this last regard, I always felt a little sorry for the She-Hulk in that she was the finest stand-in member of the FF, yet got sidelined by writers in an undignified manner when Ben came back. No honourable exit for Jennifer Walters, more of a “Ben’s back, pack your bags.”) Stan’s script is delightful, easily the highlight of the year as his lovable naive corniness is tempered with the range of a man who was then in his mid-sixties. There’s a raw, earnest edge to the pain the group go through that makes the issue genuinely heart-rending, almost impossible to read, that flies in the face of what could be overstated sentiment. The concept of a self-congratulatory love-in for the group is totally abandoned in favour of genuine hate borne out of love. (The issue also reveals that the initial rocket ship crash took place in Stockton, California). Even though it’s not directly issue-checked until the following year, Ben’s mutation is chronicled in West Coast Avengers #9. Meanwhile, there are also references to The Avengers #263, Marvel Team-Up #47, The Thing #36 and the then-current run of Captain America.